VISSCHER - Novissima Comitatus Zutphaniae, Totiusque Fluminis Insulae Descriptio, ex Officina Nicolai Visscher. VISSCHER, N. - Novissima Comitatus Zutphaniae, Totiusque Fluminis Insulae Descriptio, ex Officina Nicolai Visscher. Novissima Comitatus Zutphaniae, Totiusque Fluminis Insulae Descriptio, ex Officina Nicolai Visscher. - VISSCHER, N.
Title : Novissima Comitatus Zutphaniae, Totiusque Fluminis Insulae Descriptio, ex Officina Nicolai Visscher.. Size : 18.1 x 22.0 inches. / 46.0 x 56.0 cm. Description :Map of the province of Gelderland in the Netherlands. 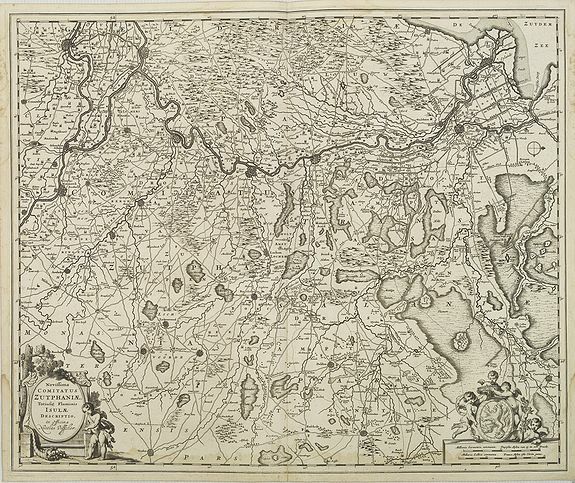 Taken from the atlas Germania Inferior, sive XVII Provinciarum Geographicae generales ut et particulares tabulae. Kaert-Boeck van de XVII Nederlandtsche Provincien published by Nicolaes Visscher II which contained 21 maps of the Netherlands. Condition : Some very light marginal spotting and light water staining. Else dark and good impression on thick paper. Good condition.